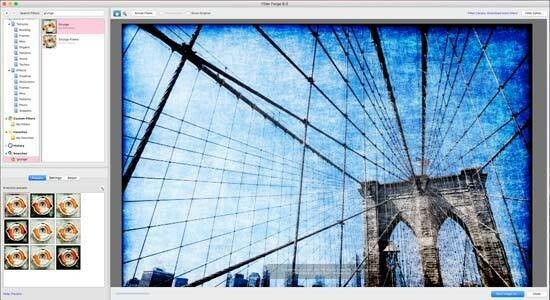 Filter Forge 6 is a plugin for Photoshop, but it can also be used as a standalone app. 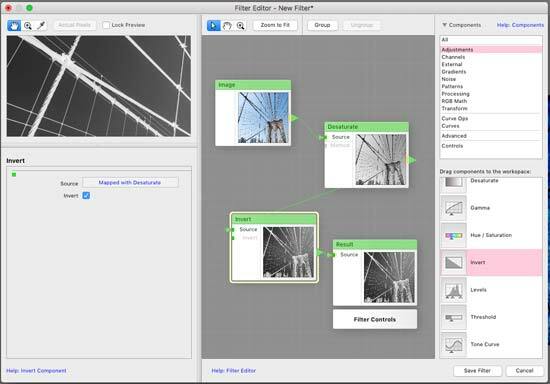 With it you can create your own filters for images, using its “node-based” editor without requiring any knowledge of coding and so on. 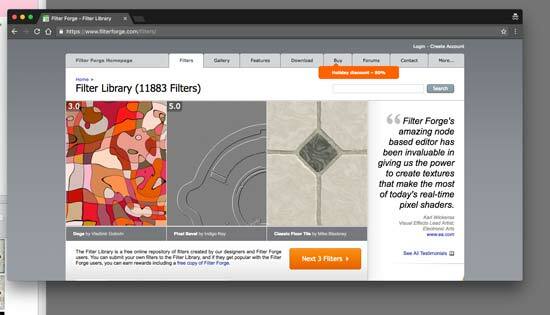 You can also access thousands of user-created filters. 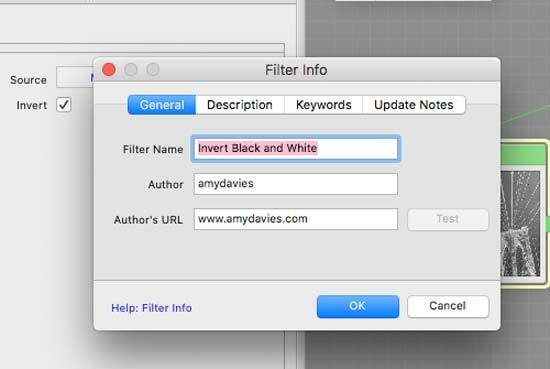 If you create your own filter and it becomes popular, you can get a free copy of the plugin / software - it is available as a fully functional 30 day trial to allow you to do this. For the latest version of the software, version 6, new features include full 64-bit support. You can download the software from the Filter Forge website, with versions available for both Windows and Mac. Once you’ve downloaded it, simply follow the step-by-step instructions to install it on your machine. We installed the Mac OS version, but it should be a reasonably similar process for the Windows option. 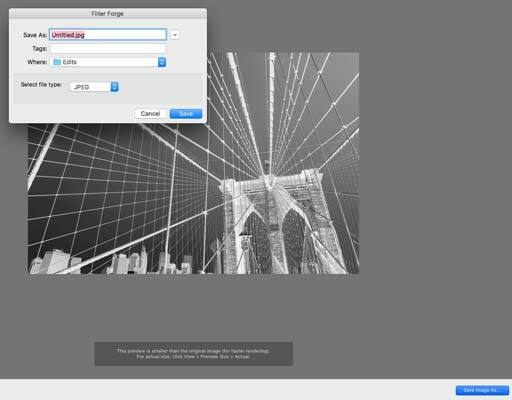 As Filter Forge 6 is also a Photoshop plugin, if you have Photoshop installed on your machine, you should find that it is automatically added to the software when you next open it. It is compatible with Photoshop CC (which we have been using it with). When you first open Filter Forge 6, a default source will be used. It’s a good idea to use one of these to experiment with while you get to grips with how the software works, and to explore the existing filters. You can of course open your own files though. It’s worth noting that in the software when used standalone, you can’t open raw format files. However, this won’t be a problem if you’re working with the software as a Photoshop plugin. One of the things that stands out about Filter Forge 6 is that it’s quite old-fashioned in appearance, looking like a piece of software from a couple of decades ago, rather than the modern types we’re used to seeing elsewhere. It doesn’t hinder the running of the software, but it’s just something to note. On the left hand side of the screen, you’ll see the presets and filters which are already included in the software. These are separated into textures and effects, which are then further separated into different categories for you to choose between. Whenever you select a filter, you’ll see in the box in the bottom left hand corner there are different factory ‘presets’ for how that filter looks. 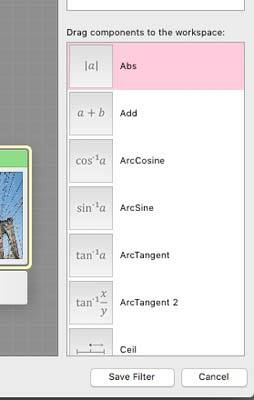 How many are here depends on the filter itself, but each should give you a variation on the filter type or theme. You’ll also find that there’s a settings tab, which gives you the option to tweak the filter - again what’s here will depend on the individual filter. 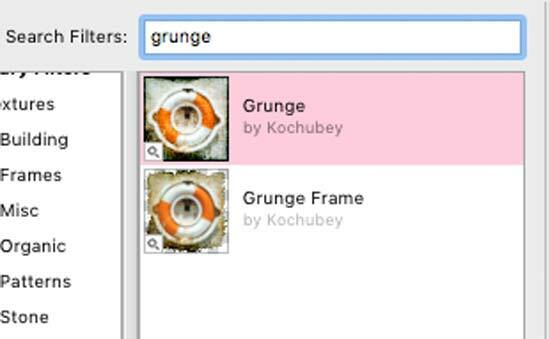 Just above the filters section is a search bar at the top of the filters section, if you want to look for a keyword which may be associated with a filter effect you’re looking for. In the Filter Forge 6 main window, you’ll see the effect any filter etc has on your image. It will be displayed at a smaller size than the original image to allow for quicker rendering and to give you an idea of what the image will look like. You can change the view to the actual pixel size though if you want too see close-up what the filter or effect will do to your image. 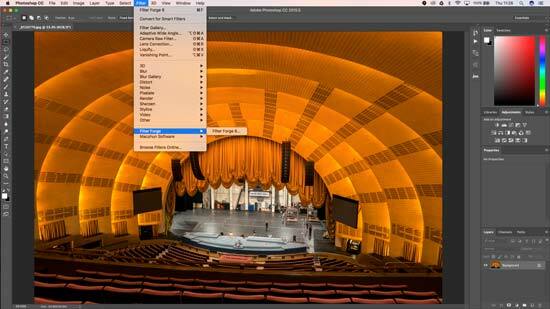 To do this you need to select View, Preview Size, Actual. In the main window, you can can click to zoom, or click on the hand icon to move around your image if it is larger than the window once zoomed in. 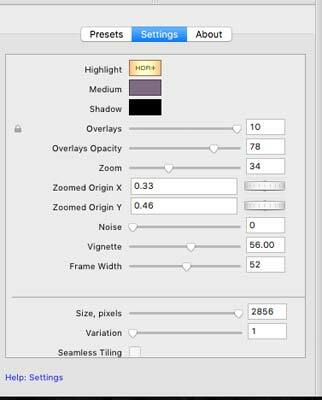 If you click the box “show original” then you’ll see that you can use a slider to compare the before and after of your filter effect. There are quite a lot of filters already pre-loaded into Filter Forge 6, but if you can’t find one you like, there are literally thousands which you can download from the Filter Forge website for free. If you click on the link “Filter Library: Download more filters”, you’ll be taken to the website to browse through and choose filters to download. Again, you can search by keyword, so if you’re looking for something specific, chances are that it may already be here. If you still can’t find anything that is to your liking, or you just want to have a go at creating your own effects, you can click on the Filter Editor to start making your own. When you click this, you’ll be asked if you want to edit the current filter //filter_forge_6_screen_10.png//, or start from scratch. 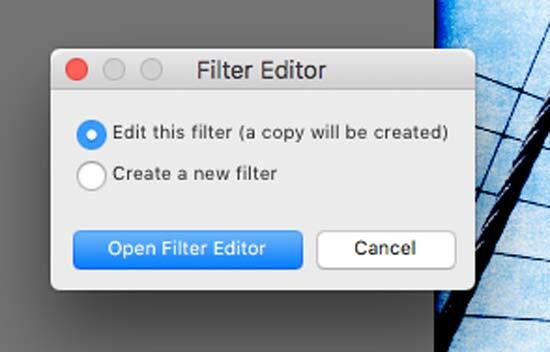 If you decide to edit the current filter, then a copy of it will be created so that you don’t have to worry about overwriting an existing. This can be a good way of slightly tweaking something you already like, without having to start from scratch. If you do decide to start from scratch, be prepared to put some time in to get the effect you want. 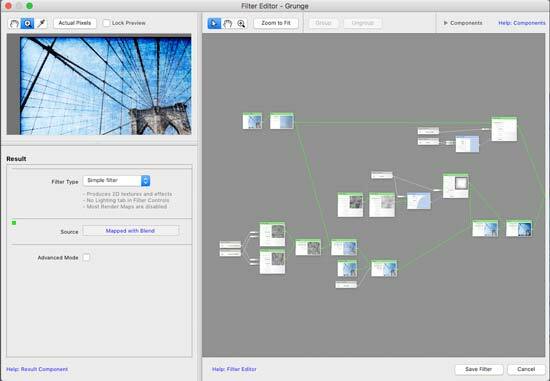 Although Filter Forge 6 boasts that you don’t need to know code to create a filter, it’s still not particularly simple, and the designer is not intuitive. It is definitely helpful to watch some of the video tutorials on the Filter Forge website to understand how to put a filter together in the first place. Basically, you create a filter by choosing different elements, and then connecting them together. However, it’s not particularly obvious how you even go about starting, or ending. You need to click on “External”, then “Image” to load a source image - if you don’t use a source image, you can still create a filter, but you won’t be able to see what it looks like as you’re going along. 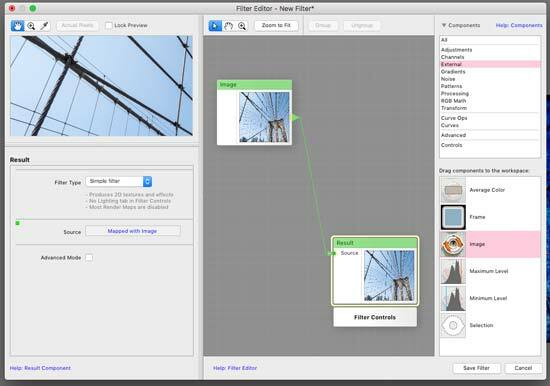 Once you’ve chosen an image, you need to connect it to the next box of the filter - and then this connects to the next one - and so on until you have the final result. Not only is starting quite complicated, many of the terms in the filter are not exactly beginner friendly, indeed, you may feel that you’re required to have a deep knowledge and understanding before you know what many of the terms mean. However, the good thing here is that you can just play around until you get the look you want. The problem here is because it’s not obvious what some of the things do, it may take you quite some time to become familiar with it. It’s one of those things though, that once you do become familiar with it, it’s very easy to use - it’s just whether you want to put it in that initial time outlay that is the question - especially when there are already thousands of pre-existing filters which you can download. 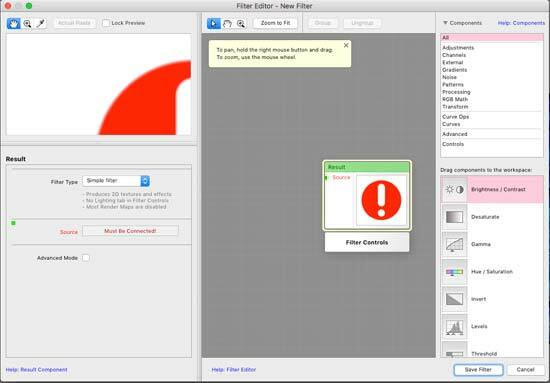 Once you’re happy with how you’ve programmed your filter, you can name it and give it a description. 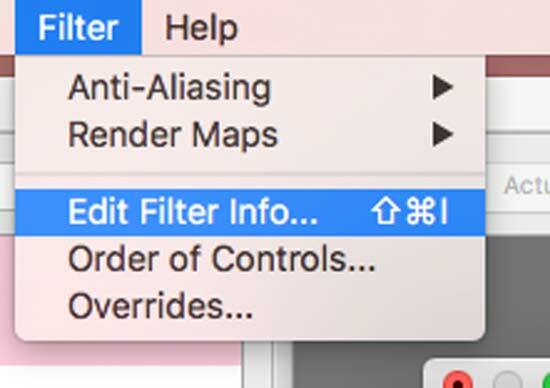 To do this click Filter > Edit Filter. 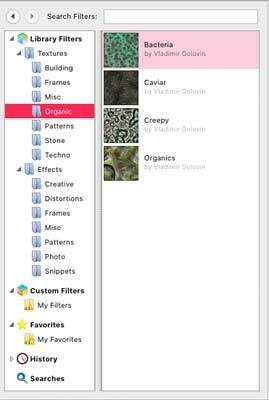 It’s a good idea to be as descriptive as possible, since if your filters are downloaded then you can be rewarded with a free copy of the software. Whether you’ve used your own filter, or one of the pre-loaded filters, once you’re happy with how your image looks, click “Save Image As” in the bottom right hand corner and you’ll be able to export your image, with a variety of file types including JPEG and PNG available. The majority of the process is exactly the same if you have been using Filter Forge 6 as a Photoshop plugin rather than as standalone. 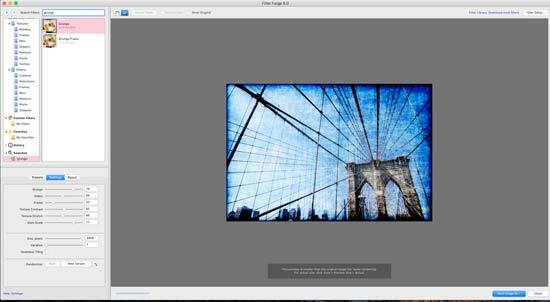 Open your image in Photoshop, then click Filter > FilterForge > FilterForge 6. The software will then open, and you can follow the process as detailed above. 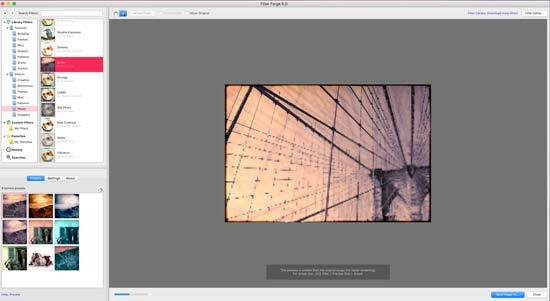 However, at the end of the process, you click rather than “Save As”, and you’ll be taken back to the Photoshop window. After a loading period, the filter will appear. The loading period depends on the complexity of the filter you have chosen - sometimes it’s almost instant, while at other times, you may be kept waiting several minutes. 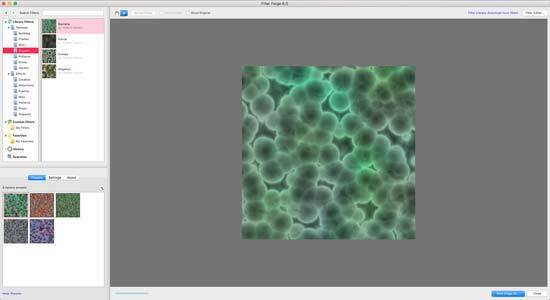 It may be a good idea to create a separate layer before you start FilterForge, so you can switch off the filter, or choose a different blending method once it has been applied, as if you don’t, it will be applied to the background image and you won’t be able to switch it off. There’s no way to automate batch processing from within Filter Forge 6 itself. Some have suggested that you can batch process by running code elsewhere on your machine, but if you don’t have any specialist code knowledge, then it’s not a simple process.